Religion and science top the list of the most successful books in history. While the Bible remains in first place, it might be surprising to learn that the second spot is occupied by a treatise written around 300 B.C. by an author we hardly know anything about. Elements, from the Greek mathematician Euclid, has been published more than a thousand times and consists of thirteen volumes on geometry and arithmetic, which compiled three centuries of mathematical thought. Copernicus, Galileo, Kepler and Newton all built their theories after learning with this textbook, which continues to be relevant today and that for many centuries propelled physics and astronomy—not just mathematics. Under the reign of Ptolemy I (367 B.C.-283 B.C. ), Euclid settled in Alexandria—one of the intellectual centres of the time with its library and its museum—where he founded an important mathematical school and wrote Elements, whose original is not preserved, but of which there are later Greek, Latin and Arab copies. In the wake of the flowering of Greek thought, Euclid brought order to and expanded on the work of other earlier mathematicians. The content of his work is as important as the structure he provided. From a handful of ideas, he demonstrated a large number of results in which he also made visible the principles of mathematical reasoning. Faced with previous ideas that were disjointed and eminently practical, Euclid demonstrated theorems using clear deductive rules, from certain predefined axioms, with the aim of not leaving any loose ends. Elements sets out 131 definitions, 5 postulates or axioms, 5 common notions and 465 propositions. Of its 13 volumes, 8 deal with geometry in the plane and in space, while the rest are devoted to the theory of proportion, arithmetic and the theory of incommensurability—the precursor of irrational numbers. Book I of Elements is the most famous: it includes the five postulates of plane geometry, which gave mathematical scholars something to talk about for many centuries. These axioms indicate that the geometric figures that Euclid managed could be constructed with only a ruler and a compass, without the need for more complex tools. The first four postulates are quite intuitive; for example, it is possible to draw a straight line from any point to any other“ or “all right angles are equal. However, the fifth axiom is less obvious, and caused many later mathematicians to try to enunciate it in another way. In any case, when a plane fulfils the five axioms of Euclid, we say that it is a Euclidean plane and we speak of Euclidean geometry. It was not until the early nineteenth century that mathematicians such as Lobachevsky, Bolyai and Gauss raised the possibility of creating plane geometries from postulates different to those of Euclid, which are known as non-Euclidean geometries. 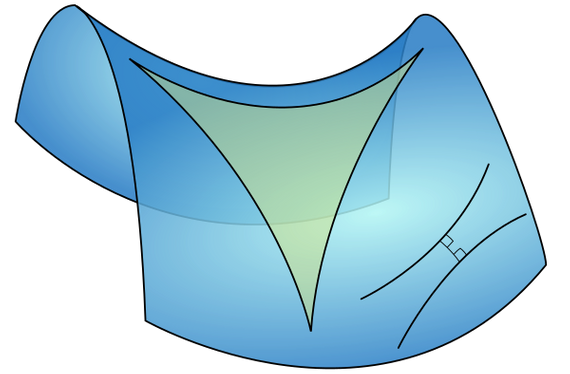 The hyperbolic geometry of Lobachevsky, which only satisfies the first four postulates of Euclid, is an example. In that case, the fifth postulate is replaced by another one that is totally new. In hyperbolic geometry, the sum of the angles of a triangle is less than 180°. Lobachevski’s ideas were slow to catch on. Although his theory was considered mathematically correct, it seemed contrary to common sense. Over time, however, its geometry was found to be useful—the universe exhibits hyperbolic geometry on a large scale—which meant a revolution for mathematics, having to revise concepts that were considered absolute truths until then. The structure of Book I of Elements set the style for rest of the volumes, which follow it and compile the regular questions of Greek mathematics. An example is the problem of quadrature or squaring of a rectangle, which consists of constructing a square of equal area to that of a given rectangle. It’s a problem that recalls the famous squaring of the circle, which from ancient Greece and for centuries thereafter fired the minds of mathematicians; but today we know that it cannot be solved using only a ruler and compass, just as the number pi cannot be represented in that way. In the part dedicated to arithmetic, Euclid’s famous algorithm also appears, which is still frequently used to calculate the greatest common divisor. 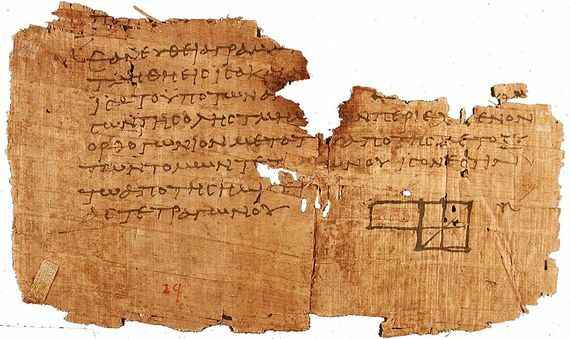 More than 2,300 years later, the mathematics of this almost unknown Greek is still being applied in secondary school classrooms.